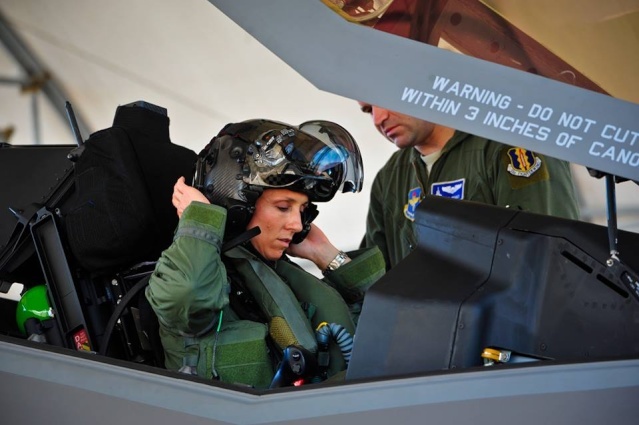 Mardi 5 février, le Lt-Col Christine Mau du 33rd Fighter Wing de l'US Air Force est devenue la première femme pilote de F-35 sur la Base d'Eglin. Elle pilotait des F-15 auparavant. ''It wasn't until I was taxiing to the runway that it really struck me that I was on my own in the jet"
"I had a chase aircraft, but there was no weapons system officer or instructor pilot sitting behind me, and no one in my ear like in simulators." "It felt great to get airborne. The jet flies like a dream, and seeing the systems interact is impressive. Flying with the Helmet Mounted Display takes some adjusting, but it's an easy adjustment" (...) "The training missions in the simulator prepare you very well, so you're ready for that flight." "Flying is a great equalizer" (...) "The plane doesn't know or care about your gender as a pilot, nor do the ground troops who need your support. You just have to perform. That's all anyone cares about when you're up there - that you can do your job, and that you do it exceptionally well." Christine Mau plaisante en disant ''que la seule différence entre elle et ses collègues hommes, c'est la taille de ma combinaison anti-G et la taille de mon masque''. » Une première Québécoise ordonnée prêtre !